As I’ve often confessed before, I am a reformed (and reforming) grammar snob. As an English teacher of many years, it’s impossible not to notice goofs when they occur, but I have vowed to be slower to judge, much slower to offer correction, and to eliminate altogether any sense of outrage over the mistakes people make in grammar, spelling punctuation, etc. I’ve made this commitment primarily because I don’t want to be an annoying person. I want to make sure I pay more attention to what people say than how they say it. I want to maintain perspective on things that matter, and I believe that while there are many things in life worth getting worked up about, grammar isn’t one of them. One goal of my blog is to do my best to spread this perspective. For the grammatically ignorant, I hope to regularly provide, not criticism and rebuke, but instruction and understanding. And for my fellow grammar experts out there, I hope to convince you to grow with me in patience and perspective. But I have to tell you that there is a type out there that tries my patience to the limit — the ignorant grammar cop. It’s bad enough to be an obnoxious, know-it-all, grammar critic. It’s even worse when you express your indignation over something that isn’t even an error. There is no such thing as a pizza with three cheeses. Just like those three cheeses can’t be consumed by three mouses. Cheese is a noncount noun. So is soap. You can’t have a package of soaps, or a line of fragrant soaps, or too many soaps from which to choose. You can only have a thousand bars of soap. The same applies to tea. Would you like to choose from our selection of fine teas? No, I would not, but I will look at your tea selection. I’m sorry people, but you can’t have soups, juices, coffees or breads. And it is virtually impossible for anything to pass “like sands through the hour glass” (I’m looking at you, Days of Our Lives). The days of our lives may only pass like sand through the hour glass. This commenter speaks with a great deal of authority, but she is simply incorrect. It is common to use plural forms of non-count nouns, especially when those nouns denote food, when referring to classes or types. A pizza can most certainly have three cheeses. You may prefer to say three types of cheese, but it’s perfectly acceptable to use cheeses in this sense. It would be non-standard to say “I had two beers after dinner,” unless you specifically mean two different types of beer. And you probably shouldn’t order two coffees at a diner if you really only mean two cups of coffee. But if you are referring to the various types of beer or coffee available, you are safe to talk about an impressive assortment of beers or coffees. This goes for anything that has classes or types: soaps, teas, breads, sugars, fruits, wines, etc.. Even the word food itself — normally a non-count noun, can be pluralized as foods when talking about groups or kinds of food. There’s no question about this. This plural use of particular non-count nouns is common in publication and supported by all reputable style guides and dictionaries that address such things. It’s not that this commenter got it wrong that bugs me either; it’s the conviction and outrage she demonstrates. Even if she were right, I don’t see why it should bother her so much. And being wrong just makes her look silly, doesn’t it? I coined a word years ago to describe this not uncommon self-assurance about something one completely misunderstands. I call it arrognance: a portmanteau word combining arrogance and ignorance. My advice is not to rant about grammar at all, but if you must, at least do your homework first and make sure you understand the issue that so irritates you. 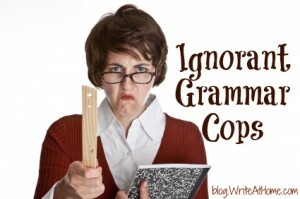 This blog applies to more than just grammar snobs! It can be tempting to go off on a rant about something we know (history, politics, religion, wine-tasting, you name it) even when we don’t know what we’re talking about. Thank you for encouraging us to write well without becoming “that guy” everyone tries to avoid because he’s always being a know-it-all. Good point, Lisa. I guess I’m just particularly sensitive to grammar snobs. They seem to be everywhere. Someone’s grammar ! do you have any suggestions ?! Unless it’s your children or someone who has asked you to help him with grammar, Haifa, I suggest you don’t correct anyone’s grammar at all. Are you asking about your children? I meant by “they are too sensitive” my colleagues sometimes I notice some mistakes and I want to help them out ..
thank you for being amazing tutor I have browsed your blog and it helps me a lot also, i have watched your video on YouTube they are awesome ..
Too late. You are not allowed to remake up my made up word. Entrepreneur is also hard to say, but you’re not allowed to change it. Arrognance is hard to pronounce. How about irrogance? Leave a Reply to Haifa Click here to cancel reply.